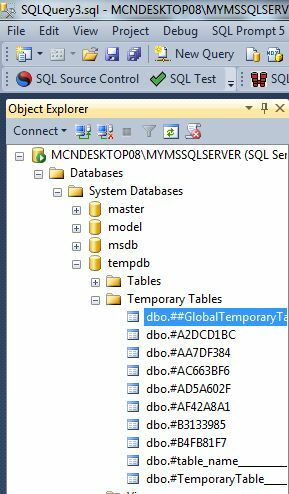 In this article, I am going to give a quick overview of temporary tables in SQL Server 2012. local temporary table, global temporary table, drop temporary table. In this article, I am going to give a quick overview of temporary tables in SQL Server 2012. Temporary tables are stored in tempdb. They work like a regular table in that you can perform the operations select, insert and delete as for a regular table. If created inside a stored procedure they are destroyed upon completion of the stored procedure. So let's have a look at a practical example of how to create temporary tables in SQL Server 2012. The example is developed in SQL Server 2012 using the SQL Server Management Studio. There are two types of temporary tables; one is local and the other is global. Global temporary tables are also stored in tempdb. Global temporary tables are temporary tables that are available to all sessions and all users. They are dropped automatically when the last session using the temporary table has completed. They are specified with the prefix #, for example ##table_name. Both tables are stored in the tempdb system database. Temporary tables are stored inside the Temporary Folder of tempdb. Whenever we create a temporary table, it goes to the Temporary folder of the tempdb database. tempdb -> temporary tables. Each temporary table is implicitly dropped by the system. Each temporary table is stored in the tempdb system database. The table variable doesn't. You can drop a singleTemporary Table or multiple Temporary Tables at a time.